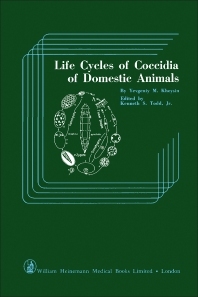 Life Cycles of Coccidia of Domestic Animals describes the structure and physiology of all stages of the life cycle of coccidian of domestic animals. This book discusses the area of location of coccidia in the body of the host. Organized into seven chapters, this book begins with an overview of the characteristics of the group of parasitic protozoa to which the coccidia belong. This text then describes the characteristics of development and duration of the coccidian infection. Other chapters consider the conditions necessary for the survival of the oocysts in the external environment. This book discusses as well the effects of external factors on sporulation. The final chapter deals with the conditions determining infection of the host by coccidia. This book is a valuable resource for microbiologists and parasitologists. Readers who are interested in the fundamental ecology of this group of parasitic protozoa will also find this book extremely useful.